One of the appeals of alternate history and steampunk is the ability to imagine wrongs of the past made right. Of course, one of the most notorious villains of the Victorian age was Jack the Ripper. For me, my first Jack the Ripper tale wasn’t alternate history, but science fiction. It was an episode of Star Trek written by Robert Bloch called “Wolf in the Fold” in which Chief Engineer Scott is accused of committing some very Jack the Ripper-like murders. 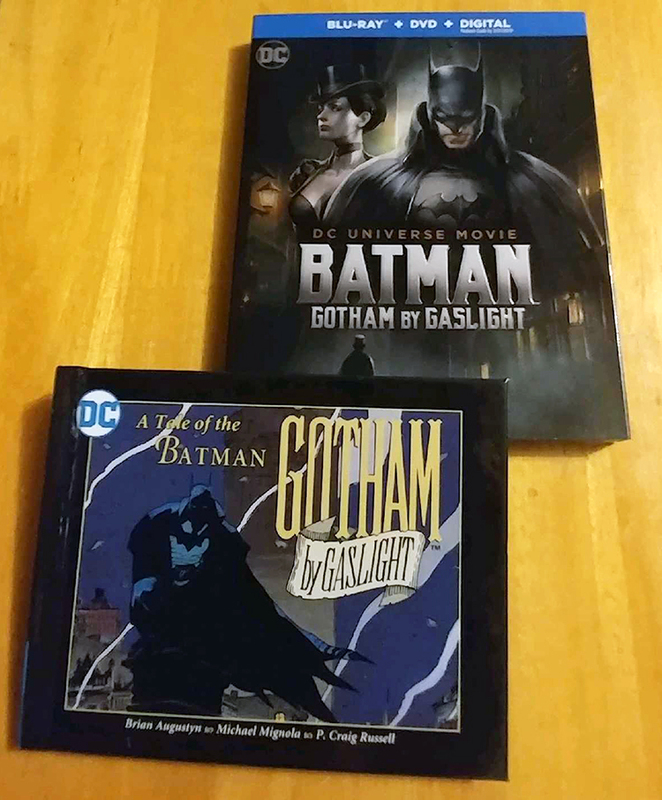 One of my earliest exposures to alternate history was the graphic novel Gotham by Gaslight written by Brian Augustyn and illustrated by Mike Mignola. It imagines that Jack the Ripper travels to Gotham City and starts his murder spree again, only to confront Batman. I bought and read the graphic novel soon after it was released in 1989. I was in graduate school at the time and comics were one of the few things I had time to read. It’s hard to call the original Gotham by Gaslight steampunk. The story pretty much limits itself to technology that was well established in the nineteenth century. That said, the artwork reminds me more than a little of Jacques Tardi’s artwork in The Extraordinary Adventures of Adèle Blanc-Sec. Also, it’s worth noting that Robert Bloch, who wrote the Jack the Ripper Star Trek episode, also wrote the graphic novel’s introduction. Earlier this year, Warner Brothers produced a direct-to-video animated adaptation of Gotham by Gaslight. I knew I wanted to reacquaint myself with this story. I watched it on Netflix and liked it enough, I went out and bought a copy. I discovered Best Buy has a special edition that includes a reprint of the original graphic novel—very cool because that meant I could refresh my memory of the original without damaging my first edition. As it turns out, the plot of the movie is quite a bit different from that of the graphic novel. This becomes apparent right away when it opens with Pamela Isley (better known to many Batman fans as Poison Ivy) working in a burlesque house and becoming the Ripper’s first murder victim. I have to admit to mixed feelings on this point. One on hand, it feels a bit like a betrayal of character to make Pamela a victim. On the other, it establishes right away that you can’t take your expectations of certain characters for granted and that does pay off as the movie progresses. It’s pointed out in the commentary that the graphic novel was only 40 pages long and that doesn’t really provide enough material to fill out a 70-minute movie. What I like is that they didn’t add stuff just to add stuff. They fleshed out the mystery and we got to see my favorite aspect of Batman—we got to see him working as a detective, hunting for clues and actually figuring out who the Ripper is. They also made it more steampunk than the original, but it’s not a gratuitous addition of gadgets. Instead, they added a World’s Fair, which was very much a showpiece of technology at the time, and they gave the police an airship. This latter works because in Batman: The Animated Series the police are shown as having airships, so it was great to see that idea explored in this alternate history version. They also gave Batman a couple of steampowered gadgets. Of course, Batman always needs cutting-edge technology in his work. There’s great voice acting in the movie with Bruce Greenwood as Batman, Anthony Head as Alfred the Butler, and Jennifer Carpenter as Selina Kyle. The DVD’s special features are pretty much teasers for other DC/Warner film projects, but the Blu Ray includes a couple of bonus Batman cartoons, a commentary and a making-of featurette. All in all, this ended up being one of my favorite adaptations of a DC comic book. It seems like the makers of the live-action DC movies could learn a thing or two from the animation department. Of course, if you’re in a steampunk mood, you should check out my Clockwork Legion series. I have plenty of airships to go around, plus there’s even the New Orleans World Cotton Exposition in the fourth book—one of the original World’s Fairs. You can learn more about the series by visiting: http://www.davidleesummers.com/books.html#clockwork_legion. If you’re in Las Cruces, I’m signing copies this morning at COAS Books downtown from 10 until noon. If you miss that, I’ll be at Branigan Library tomorrow from 2 until 4pm. A few weeks ago, my friend William J. Jackson posted a review of the movie April and the Extraordinary World on his blog. William is the author such novels as An Unsubstantiated Chamber and Cerulean Rust. Be sure to check out his blog and his books at the links above. When a steampunk writer of William’s caliber recommends a steampunk movie I haven’t heard of, I take note. 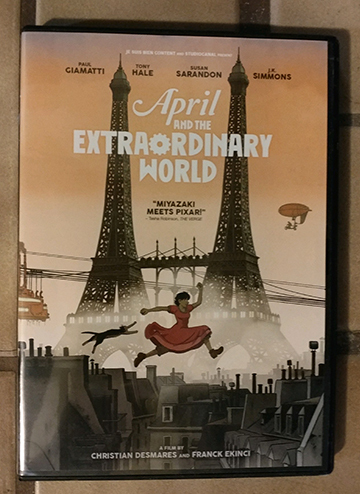 April and the Extraordinary World is a Belgian-Canadian-French co-production based on the visual style of Jacques Tardi, who is probably best known for the early steampunk graphic novel series The Adventures of Adèle Blanc-Sec, which was adapted into a live action movie in 2010. April and the Extraordinary World came out in 2015 and starts by imagining a scientist named Gustave Franklin who has been creating super soldiers for Napoleon III. When the emperor comes to visit, there’s an accident and the two most promising super soldiers escape—a pair of hyper-intelligent Komodo dragons named Rodrigue and Chimène. If that last sentence alone doesn’t make you want to watch this film, I’m not sure what will! We then jump ahead many years to a future where Napoleon IV rules France. Many scientists such as Einstein and Fermi have just vanished and the governments of the world are secreting away what scientists they can. Gustave’s son and grandson are working on a formula to regenerate the cells of animals to heal any injury and possibly extend life indefinitely. They come to the attention of those who are making scientists disappear and pass the formula on to their daughter, the April of the title, just before they disappear. We now skip ahead a few more years to a point where April is a young adult and a scientist in her own right. The police are trying to round up any scientists they can get their hands on to work for the government. Meanwhile other mysterious forces have discovered that April has continued work on her parents’ formula. She finds she must get to the bottom of this conspiracy of vanishing scientists in order to learn the fate of her parents. Even though we’re now in the world of the 1940s, everything is still steam powered. The streets are clogged with smoke and dirty. Gas masks are the province of the elite. This alternate 1941 Paris is a beautifully rendered, if frightening steampunk world. The artwork not only takes inspiration from Jacques Tardi, but from Japanese filmmaker Hiyao Miyazaki. One minor issue I had with the film was that early on, it makes a point of telling the audience “this is alternate history” and “this is how we’ve changed the world from the one you know.” The best speculative fiction works by just introducing you to the world and showing it to you in such a way that you suspend your disbelief. That said, this straightforward approach may make this a good film for introducing those who don’t understand steampunk to steampunk. My one other minor issue is that for a plot so embroiled in the work of scientists, some of the technology seemed almost magical in its amazing abilities. This magical element is part of what reminds me of Miyazaki and its beautifully rendered, but I might have enjoyed the film just a little more if some of the inventions we saw seemed just a little more plausible. Those minor nitpicks aside, I highly recommend the film. It’s one of those I rented on Netflix, then immediately decided I needed a copy and was delighted to find one at my local Barnes and Noble. It was in the anime section, appropriately next to Miyazaki’s films! The ebook edition of my novel Dragon’s Fall: Rise of the Scarlet Order is on sale for just 99 cents from today through January 21. This is my novel that tells the origin story of the Scarlet Order vampires. The novel opens in Hellenistic Athens, when the slave Alexandra is sold to Theron, a mysterious banker who is never seen during the day. As time goes on, she notices that slaves called upon to serve Theron in his chamber at night do not return the next morning. When Alexandra’s turn comes, she learns Theron is a vampire who takes his pleasure with the slaves, then drinks their blood. She refuses to be a victim, but as she fights his embrace, Alexandra ingests some of Theron’s blood and becomes a vampire herself. Next we meet Desmond, a dragon lord in the service of King Ambrosius in Britain of the year 480. He longs for the king’s daughter, the beautiful Guinevere. However, her heart belongs to the king’s young ally, L’ancelot. When Desmond and his friend Arthur are sent to battle Saxon invaders, Desmond is mortally wounded. He is saved by Wolf, a vampire who is seeks the Holy Grail in hopes that it might bring salvation to their kind. Desmond knows he and Wolf cannot find the Grail alone. He returns to court where he finds that Guinevere is pledged to Arthur but still longs for L’ancelot. Now king, Arthur is anxious to remove L’ancelot from court for a time, so he agrees to Desmond’s request for aid in the search for the Grail cup. A century later, Desmond’s quest carries him to Constantinople and there he meets Alexandra. He persuades her to join him on his quest and the two fall in love. However, Desmond is unaware that another vampire lurks in the shadows. The mysterious Roquelaure, whose identity is cloaked even from himself, serves the human underworld as an assassin and also loves Alexandra. Three vampires forge a bond of love and blood. Together, they form a band of mercenaries called the Scarlet Order, and recruit others who are like them. Their mission is to protect kings and emperors against marauders, invaders, and rogue vampires. Their ultimate test, though, comes when they’re hired by none other than Vlad the Impaler. 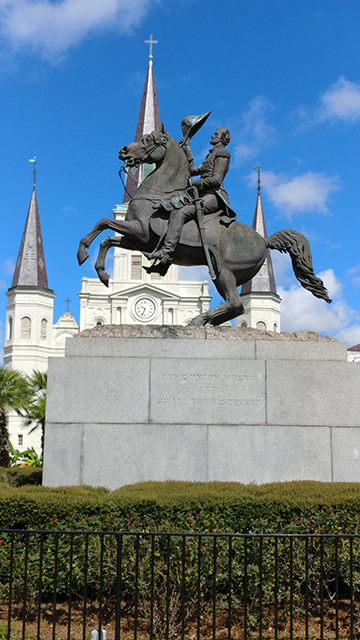 In the spring of 2014, when I first visited New Orleans, I looked up at the statue of Andrew Jackson in front of the St. Louis Cathedral and thought, wouldn’t it be cool if Jackson was riding a hadrosaur instead of a horse. As that thought occurred to me, I could almost hear the bellowing of hadrosaurs echoing the walls of Pirate’s Alley behind the cathedral and I knew I wanted to write a story about the Battle of New Orleans with dinosaurs. That fall, I went to MileHiCon in Denver and Dana Bell told me that she was considering an anthology about extinct and mythical creatures living outside their time. She wanted to ask what if those ancient creatures of so beloved in fiction, myth and science had not disappeared or been real? What type of uses might have been developed to handle them and how might man have felt about the thundering giants in yesterday’s, today’s, or tomorrow’s worlds? I pitched my idea and she invited me to send the story. I wrote it up, sent it in, and she ultimately accepted it. And now, I’m pleased to announce that Extinct? is available for sale and “Jackson’s Hadrosaurs” is the lead story in the volume. What else will you find in the book? Imagine a sanctuary for dinosaurs that displaces humans. Raptors used on a distant planet as scouts for a new colony. Dodo birds leaving a record about what happened to them or an unusual way dragons help settlers. 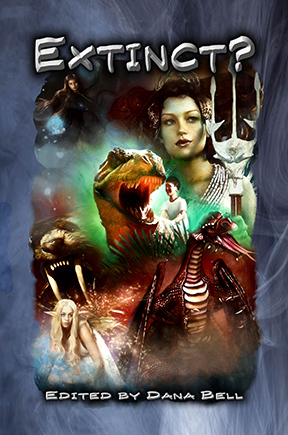 A conqueror who learns a hard lesson from a goddess and two children who create their own monster. You’ll find lovely tales about those lumbering giants of old in ways not shown before, of those who ruled the skies and many others once thought to be mythical, and yet, here they appear in Extinct? One of the things I wanted to explore in my story was the notion of herbivorous dinosaurs somehow being “tame” or “safe.” I think anyone who has spent time on a farm or around animals knows that herbivores can be dangerous if not treated with respect. On another trip to New Orleans, I stopped at a rest area and saw a crane standing in a bog while an alligator swam around hunting. The bird and the reptile were completely at ease with each other. Both seemed much more interested in eating the fish that swam around them than fighting. It made me think of symbiotic relationships in nature and I began to wonder how alligators would react to dinosaurs. Would they be friends or enemies? You can see my approach in the story. When I was in New Orleans this past summer, I drove out to the Chalmette Battlefield, site of the real Battle of New Orleans. I was gratified to see it that it was much as I pictured it from descriptions. 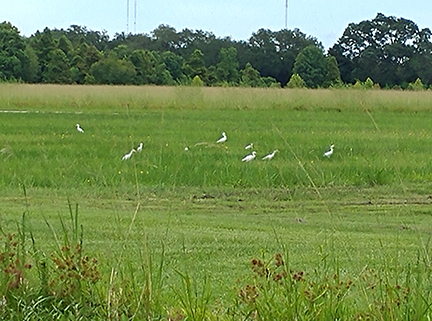 What’s more, I found descendants of dinosaurs wandering the field. This March, I’ll be moderating a panel called “Building Alternate Worlds” at the Tucson Festival of Books. To prepare, I’m reading the books by the authors on the panel and learning about the worlds they’ve built. This topic is particularly near and dear to my heart because I’m going over my notes and getting ready to start work on book four of my Clockwork Legion series. In a very real way, books one through three of my Clockwork Legion series were all about building an alternate world. I started my story in a version of 1876 New Mexico that was mostly the world of history. I say “mostly” because the wild west of fiction is an almost mythical place built up through many years of literature and cinema. People come to western stories with certain expectations of the west and it’s hard to ignore those expectations even when they don’t entirely match the world of history. I then dropped in a catalyst, which was an advanced alien called Legion who had traveled the universe and came to Earth. This alien is the embodiment of Heisenberg’s Uncertainty Principal, which in a nutshell says you can’t observe a phenomenon without affecting it. Legion’s first interactions with humanity are accidental, but then he grows curious and decides to make the world a better place by attempting to unify humanity. The problem is that in the 1800s, much of humanity’s idea of unification is conquest through imperialism. Over the course of the books, the world changes and we see the development of airships, mining machines, lightning guns, clockwork automata, and ornithopters. Legion influenced the creation of some of these things. Others were created to combat the imperialists who sought to use these inventions. Of course, the interesting story is less that these machines were created, and more how people used these machines. That’s where the world building comes in. The idea of book four is to drop into this world-that-wasn’t eight years after the events of The Brazen Shark and see what people have done with it. I plan to open the story in New Orleans, where Ramon Morales is working in a law firm and his wife Fatemeh is trying to gain acceptance as an apothecary in a man’s world. Cotton farmers have sponsored the World’s Fair to show off new technologies they’re using in agriculture. This World’s Fair actually existed, but the technologies will be much different. They’ll be showing off the automata used to plant and harvest crops and the airships used in distribution. At the World’s Fair, Ramon will meet none other than Doc Holiday, who will drag him back to a wild west that neither he nor the reader will immediately recognize. I look forward to playing in this alternate world. For those who would like a smaller dose of my Clockwork Legion world, short stories featuring these characters can be found in the anthologies Lost Trails 2: Forgotten Tails of the Weird West, Den of Antiquity, and the forthcoming Straight Outta Tombstone.